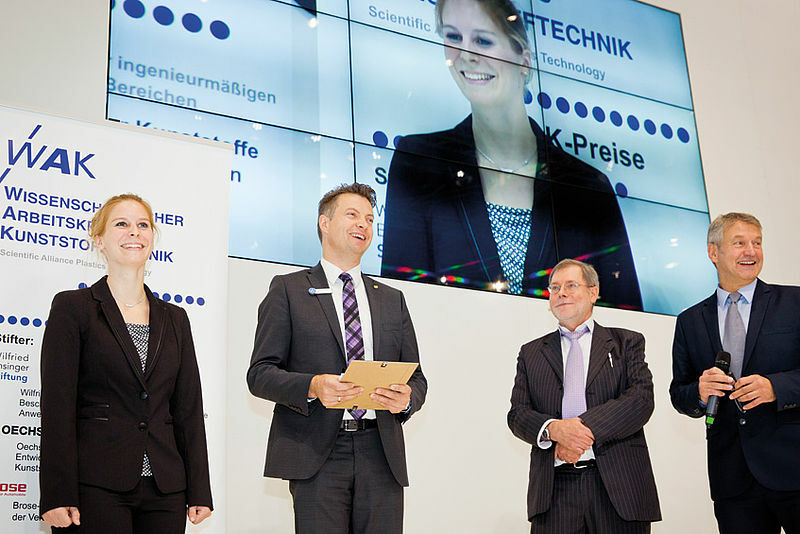 Nadine Magura, a scientific assistant at IKV, received the Röchling Prize for her master's thesis on analysing the potential of an adhesive-free, cohesive bond to a thermosetting-thermoplastic hybrid. On October 21, during K 2016, awards were presented by the Scientific Alliance of Polymer Professors (WAK) for outstanding scientific work in the field of plastics technology. Nadine Magura, a scientific assistant at IKV, received the Röchling Prize, which is awarded for new hybrid materials, systems and process techniques based on plastics, for her master's thesis on analysing the potential of an adhesive-free, cohesive bond to a thermosetting-thermoplastic hybrid. The prize winners received their awards from Prof. Dr.-Ing. Peter Elsner, Chairman of the WAK and the Fraunhofer Institute for Chemical Technology in Pfinztal. The WAK presents four awards every year: the Wilfried Ensinger Award, the Oechsler Prize, the Brose Prize and the Röchling Prize. In each case, one award is made for a diploma or master's thesis worth 3,500 euros and one for a doctorate dissertation worth 5,000 euros.